This refreshing, tropical cocktail can be enjoyed with or without alcohol. 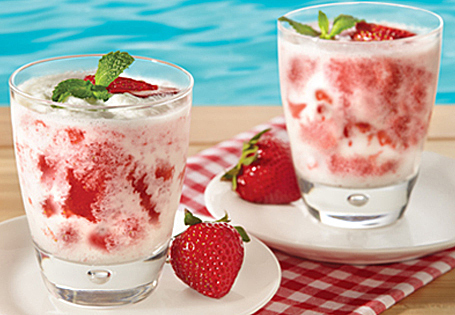 In a blender, puree frozen strawberries with 2 cans of soda or 1 can of soda and rum, until smooth. Set aside. Rinse blender. Add coconut ice cream bars and remaining 2 cans of soda. Process until smooth. Layer each glass with 1 cup strawberry mixture and top with 1 cup coconut mixture.